» Entertainment » #BBNaija:Few Hours To Eviction Night. Who Will Leave The House Today? #BBNaija:Few Hours To Eviction Night. Who Will Leave The House Today? The Big Brother Naija eviction night draws closer with every tick of the clock and somebody must be evicted tonight. 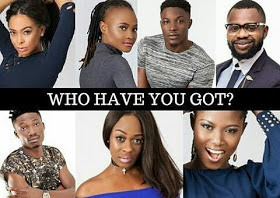 Which of these Big Brother Naija Housematesdo you think will be leaving the house tonight? Title : #BBNaija:Few Hours To Eviction Night. Who Will Leave The House Today? 0 Response to "#BBNaija:Few Hours To Eviction Night. Who Will Leave The House Today?"